Many stories accompany this collage of photos. First of all, explanation. 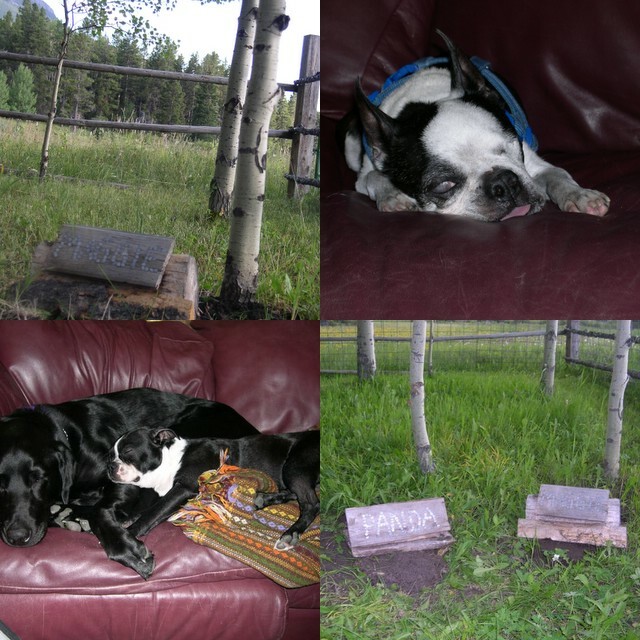 Top left is Maggie's grave up at our cabin in the Crazy Mountains. Maggie will be the topic of much of this post, so more on her later. To the right is Panda, the summer before she died at a ripe old age of 14 (?). Below Panda is her grave, where it has been added to the place right next to Maggie's. And finally, Piper and Bailey represent generation #2 of our awesome Black Lab-Boston Terrier dynamic duos. I remember begging my parents for a dog when I was in kindergarden and first grade. And finally my parents graciously relented, getting me and my brother two black labs, Maggie and Spot. Maggie became my near-constant companion for the next 14 years. Even after I left for college, she would go back to sleeping on my bed when I came home for summers and vacations. She was the most loyal, gentle, beautiful lab; Piper was complimented when a neighbor told him that he might some day live up to Maggie's status. What prompted this whole post was the previous posting that I made about the father and daughter in Starbucks. These were the days before Starbucks. I remember once my dad and I were driving somewhere with Maggie in the car, and we stopped at the Blue Basket (gas station) to get gas. He came out with two huge blueberry ice cream cones. I held one in each hand while Maggie and I each enjoyed our own. Not only were those not the days of Starbucks, they were also not the days of digital photography; so instead you have a picture of her grave. Incidentally, I chose to bury her ashes there (after they'd been in a box in the garage for a few years!) because in my days of black and white photography, I snapped a picture of her sitting next to that tree. Panda also approved of that burial site because even though she was deaf and blind, when we were digging for Maggie, she kept wandering over into that area. It didn't matter where we placed her in the yard, she ended up there, and now she's there for good. I have another memory that is similar to the blueberry ice cream cones. My dad had taken me and Maggie fishing on the Bighorn River in his boat. When we got off of the river in the evening, we went through this drive-through restaurant, where he ordered each of us a corn dog. Again, we ate them in unison with me holding onto the sticks for both of us. I don't eat corn dogs much, but they always evoke that memory for me. Our chapel speaker on Friday told us with sadness that they had put down their dog - Molly - the day before. I visited with him about it afterwards - to give him my condolences - and he made an interesting, but very true, comment. He said that Molly died at 15, which for a dog is a very 'ripe old age.' She had fulfilled the precisely the purpose for which God had created her, to provide joy and companionship to her owners. And even something relatively small like the death of a pet is a reminder of how sin has impacted our world -- not even animals were supposed to die in God's glorious creation.